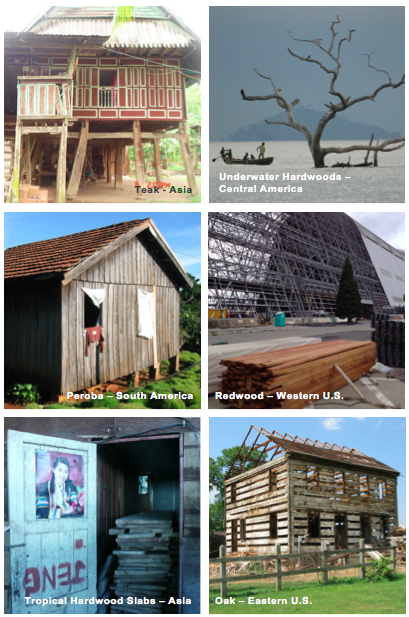 We travel the world in search of the most beautiful and highest quality specialty reclaimed woods. We do it with an eye for materials we can secure in relatively large quantities and on an ongoing basis. While on occasion we'll secure one-off inventories – and some of these are phenomenal - generally we want to offer materials that will be available for years to come. Often we're asked, "When will you run out of reclaimed wood"? Despite having done this for more than 20 years (or perhaps because we HAVE done this for more than 20 years! ), we just keep finding more and more and more. Keep in mind, we humans have mostly decimated our old-growth forests worldwide. Fortunately, billions of board feet of this material is still in service and will become available for us to reclaim for generations into the future. Post-Consumer Reclaimed – factory and commercial buildings, houses, tanks, barns, dunnage, bleacher seats, etc. Water Reclaimed – standing forests flooded decades ago to create reservoirs, as well as sinker logs. Post-Industrial Reclaimed – off-cuts from an industrial process, such as veneer or furniture making, that are typically sent to the landfill or burned. Orchard Salvage Reclaimed – acacia, walnut and other trees that are no longer productive and need to be replaced. Forest Floor Salvage – smaller diameter trees can be deemed unworthy in the timber cutting process and are left behind. Typically, this rejected wood is chipped into mulch. Most TerraMai woods are certified recycled according to the standards of the Forest Stewardship Council (FSC), the world’s premier forest conservation organization (TerraMai's FSC certification number is SCS-COC-001014). Most TerraMai products can also help a project earn points toward Leadership in Energy and Environmental Design (LEED) and WELL Building Standard credits. Which credits, specifically, depends on the product and the project. Many of our materials have been tested and are in compliance with VOC test requirements for the CDPH V1.2 standard. Add to this unparalleled breadth and depth of reclaimed woods TerraMai’s custom milling and finishing capabilities and the design possibilities are endless. We love seeing these gorgeous materials end up in amazing projects.